Danny Peterson | 2/12/2019, 3:38 p.m. 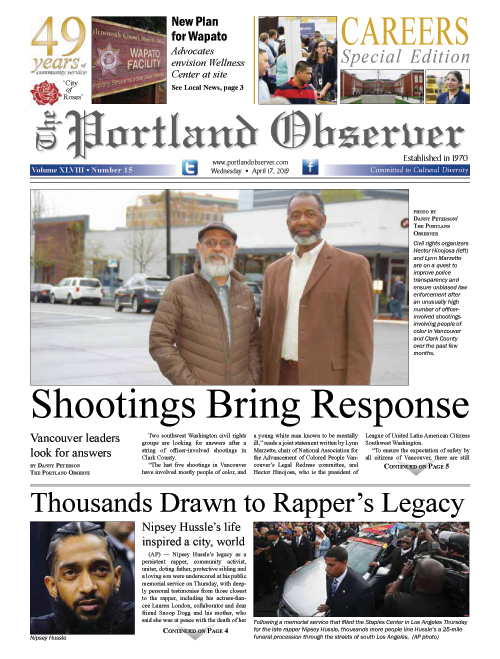 The efforts include Wellness within Reach which distributes affordable exercise passes to the Charles Jordan and Matt Dishman Community Centers—Portland Parks & Recreation facilities in north and northeast Portland respectively—and a Diabetes Prevention initiative. The exercise passes promote good health practices and are being distributed from the club’s second location, Miracles Central at 1306 N.E. Second Ave. to self-identifying African American residents for $25 per quarter. The Diabetes Prevention program addresses the growing epidemic of African Americans developing diabetes at a disproportionate rate. The outreach encourages a healthy lifestyle through diet, weight loss, and exercise, with the desired outcome to prevent or delay Type 2 diabetes. The African American Health Coalition had dissolved in June when its executive director Corliss McKeever, retired. Miracles Club, which had been a partnering organization to the coalition, then worked with McKeever to make sure the programs continued, explained Taylor, who grew up attending Miracles Club community events as a child and has been its program director for the past four and a half years. “When [McKeever] decided it was time for her to retire, she didn’t want the programs to fall with her. So it was a matter of, hey friends, this is what’s going to happen and we want to make sure we continue to sustain the community,” she said. Wellness within Reach Administrative Coordinator Makda Berhane, who previously worked for the coalition, said the transition is really going well and she wants community members to fully take advantage. “If people are interested, I want them to exploit this program. It’s really a good program,” Berhane said. The Miracles Club has been dedicated to offering addiction recovery services and support for community members, mostly African American, since 1993. Both at their headquarters at 4200 N.E. Martin Luther King Jr. Blvd, and their secondary Miracles Central location in the Lloyd district , where the exercise passes can be obtained, and the location of a community center downstairs and apartments upstairs for people in addiction recovery. The Charles Jordan Center is located at 9009 N. Foss Ave and the Matt Dishman Center is located at 77 N.E. Knott St. Both centers offer recreational and fitness activities. The $25 Miracles Club exercise passes allows access to both fitness centers, now through March 31.